You can trust Cakes By Andrea to deliver a beautiful, distinctive, custom-designed and totally handmade cake to suit your company’s requirements. Andrea is a skilled and experienced cake designer who can create an impressive cake for your event. Because her focus is on designing custom cakes based on her own design techniques she chooses not to take orders for copies of cakes created by other people. Andrea does not provide “slab cakes” or simple cakes with hand-piped icing. If you want a quality cake with a designer twist to impress your clients, staff, investors or overseas visitors please contact Andrea using the form below. Andrea offers an obligation-free initial discussion to explore what you would like for your occasion so she can design a unique cake for your special event. Hi Andrea, just wanted to let you know that the cakes were a resounding success at our opening! Everyone commented on how yummy they were and they loved the fondant designs! Thanks again for being part of the success of our event. I was very impressed with the attention to detail and quality of the cake. I thought it was very professional looking and it looked ten times better than I had imagined! After looking around at other websites and a few phone calls, I decided on Cakes by Andrea as the images and comments on her website were far better than others. I had also already spoken with her on the phone and she seemed lovely! Everything was just how I had asked for it to be. Why don’t you see full pictures of Andrea’s cakes? 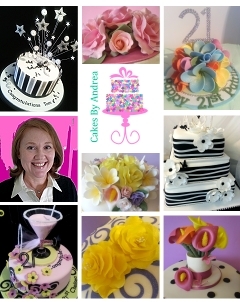 Andrea is a cake designer and spends many hours developing and creating unique and beautiful cake designs for clients. To protect her designs (from others who might want to copy) and keep them special for clients she doesn’t display full pictures of finished cakes. Please note the actual price will depend on a number of factors such as the size of the cake, the overall design and the type of cake. Delivery available in Brisbane from $40 and Gold Coast from $50. Payment options include MasterCard, Visa, PayPal and electronic bank transfer. A 50% deposit will be required to book in your cake with the balance due 2 weeks before delivery or pickup. To enquire about a special cake for your corporate event call Andrea directly on 0400 743 848 or use the form below to request a callback. Note: Due to the custom-designed style of cakes I create I do not provide ‘slab’ cakes or do basic hand piping or printed logos on simple cakes. However I am happy to discuss options for a beautiful custom designed cake with you.